Mr. Mouse wanted to go see Mont St-Michel. I had already been but that was 30 years ago and my main memory is legs. When you’re 4 years old in a very popular tourist destination, you mostly see legs. And cobblestones. So we went to Normandy. We had to go to Mont St-Michel twice. The first day, they had electrical problems and ended up closing so we never got to visit. So we went back. In between those two visits, we visited Bayeux. 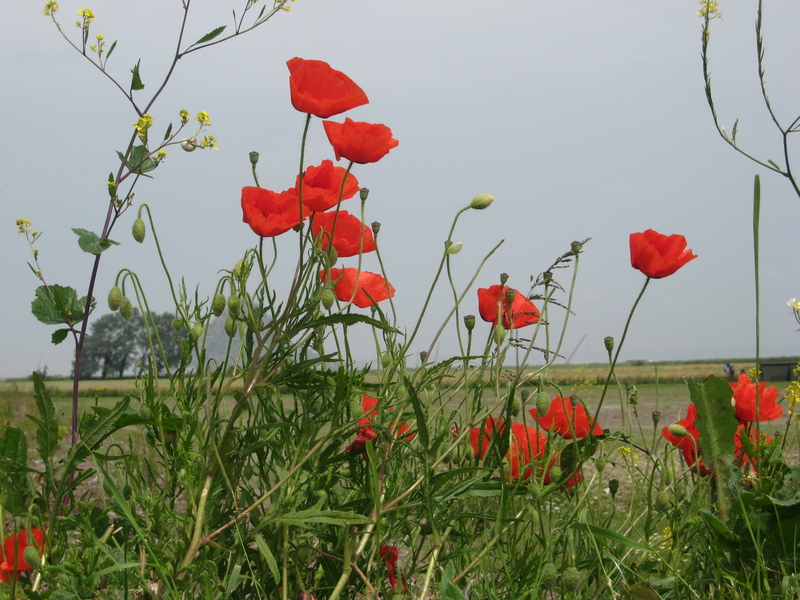 Driving through Normandy, I noticed the poppies. Lots and lots of poppies growing in the fields. I couldn’t help remembering the poem each and every time I saw those poppies. I don’t have much of a personal connection to World War II, much less World War I. It may seem so false or sappy or whatever but I can’t help it. 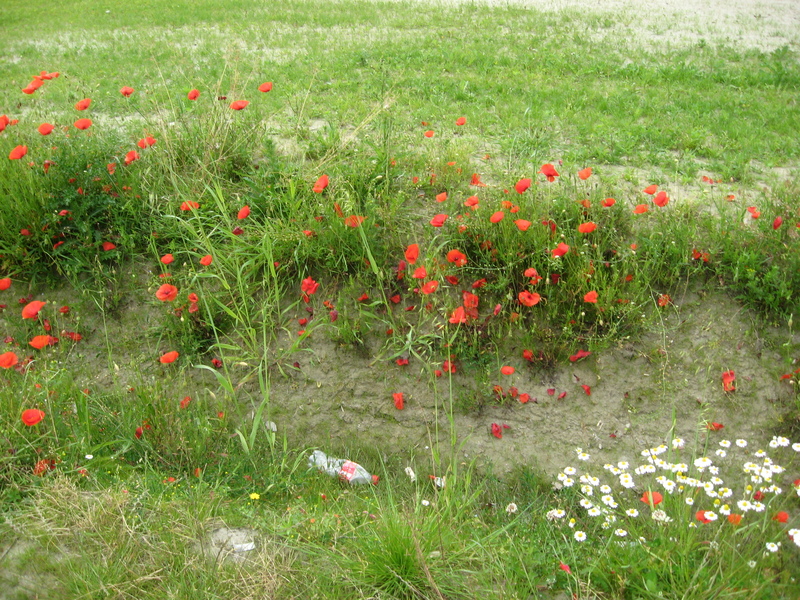 The memorials, the poppies… I can just imagine those soldiers, so cold and wet, dirty and scared. All the ugliness and horror we humans are capable of. Just typing it out makes me cry. I feel so silly. Like someone is going to come tell me to snap out of it. It’s not like it awakens any memories in me. I’ve never been through anything even remotely like that. I just can’t help imagining. Actually, no. Imagining feels too deliberate, intellectual. This is more of a visceral reaction. It just… I have no words. And then, you see the beaches, so peaceful. 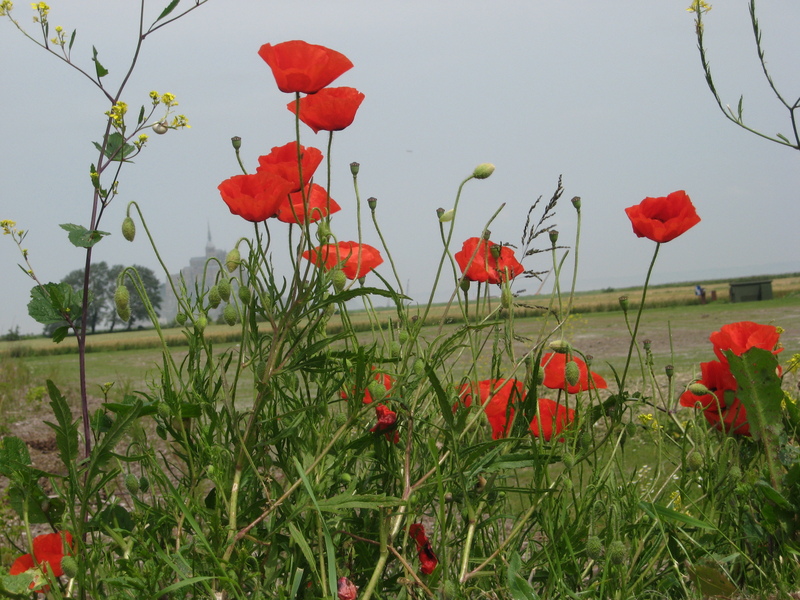 The poppies in the fields, so beautiful. Those images of war, in black and white, so fresh in my mind, and those poppies, so bright and vibrant… I couldn’t look at those poppies without feeling. I had to photograph them. And I had found a cluster of them that I especially liked next to the parking lot at Mont St-Michel. On our second visit, I decided to stop and take a picture. Mr. Mouse had to use the restroom and could absolutely not take a child with him, not even a baby on his back. And no bags. So I had the two mouselings, the diaper bag and all the souvenirs we’d bought. And I tried to take a picture. Easier said than done. The first picture was from above which everyone knows doesn’t give you the best image of a flower. 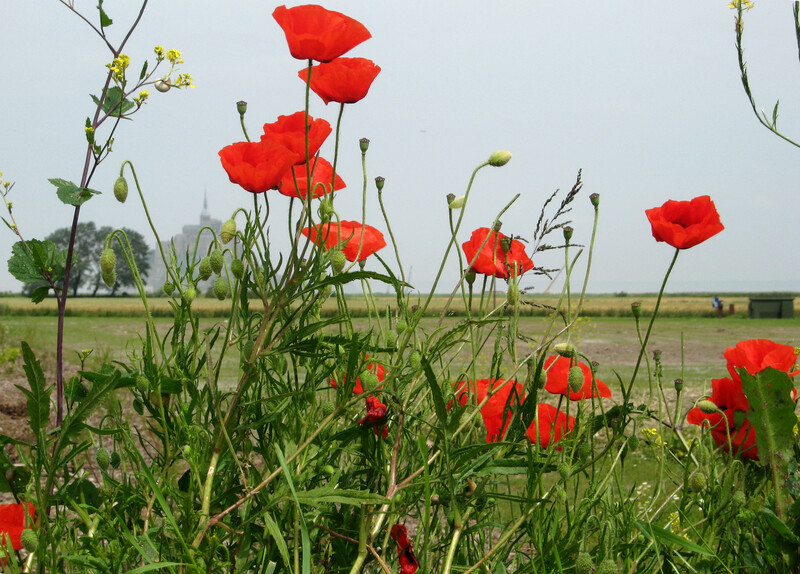 I crouched as best I could to get closer to the flowers and noticed that I could see Mont St-Michel in the distance. My first shot was good but Mont St-Michel was behind the flowers and you couldn’t see it well. In the second shot, it was visible (more than I thought it was at the time) but the horizon was crooked. That’s when I gave up. I was tired and thirsty and carrying a heavy load. And we still had to walk to the car. Mont St-Michel is there but it’s so crooked!